Broncos defensive coordinator Wade Phillips had a big ole chain around his neck for Opening Night, although it probably wasn't his. The NFL turned media day into Super Bowl Opening Night to give players and coaches a bigger stage ahead of Sunday’s big game. And that primetime slot allowed them to show off some ridiculously expensive jewelry. The Denver Broncos were first to take to the podiums, and they set the stage in a big way with some really big chains. 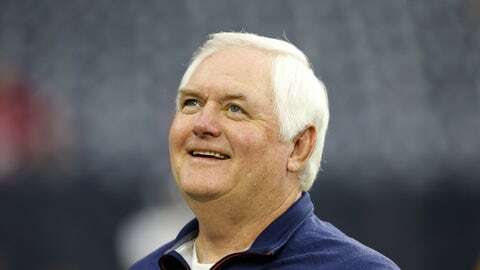 And yes, 68-year-old defensive coordinator Wade Phillips got in on the action. Joining Phillips on the bling train was cornerback Aqib Talib, who was wearing a Rolex supposedly worth $80,000. The gold rush didn’t stop there. Safety T.J. Ward showed off his chain, complete with a Jesus piece. Chris Harris Jr. didn’t have the same Jesus pendant as Ward, but his chains looked plenty expensive.